In Mitrovica, a city in the northern region of Kosovo, the vivid memory of a war that ended in 1998 lays dormant in the city’s streets and bridges. The North and South are divided by the Ibar river. Several bridges connect the two sections, however, there are people who have never walked across them to visit the other side. The Northern section is mainly populated by Serbs and the Southern, by Albanians. This extreme situation started directly after the war between an Albanian guerrilla group -the Kosovo Liberation Army (KLA), and the forces of the Federal Republic of Yugoslavia. This war lasted from February 1998 until June 1999. Eighty years after the war and ten years after Kosovo self-declared independence from the Republic of Serbia, the north of Mitrovica continues to be run by the Serbian government. Sectors such as education and healthcare are governed by Serbia. However, other sectors, such as security or justice belong to Kosovo’s governing authority. A hybrid situation that remains in a state of crisis where language and culture barriers also confront its citizens, causing Serbians to feel oppressed. Signe Borch, a Ph.D. researcher at Department of Social Anthropology at Gothenburg University and author of the scientific article`In ‘no man’s land’: the im/mobility of Serb NGO workers in Kosovo´, explains some of the oppression Serbians in Northern Mitrovica feel. “Firstly, from Kosovo authorities as they are seen as illegitimate. Even though the north of the region is part of the territory of Kosovo, people there live as if it is a no-contested part of Serbia,” she says. Indeed, Kosovo authorities and EULEX have little access to the region and some institutions – such as education and healthcare – are governed by Serbia. Therefore, “all political decisions made in Kosovo’s parliament – that somehow affects the north of Kosovo – are perceived by the Serbs as oppression against their ‘right’ to self-rule”, she states. 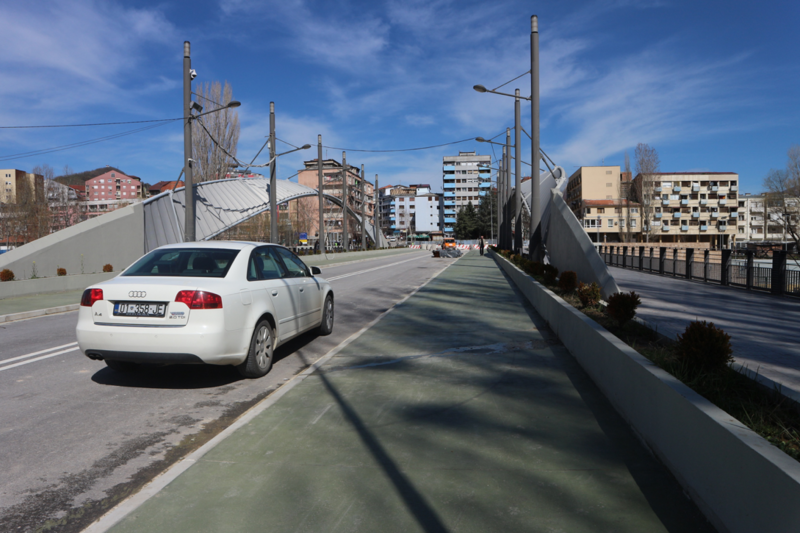 This political scene has created two parallel political realities for the people living in the north region of Mitrovica. “At the same time” – Borch continues- “the situation for the northern ‘Kosovo region is becoming more and more precarious as Serbia proper is making deals with Kosovo authorities pressured by the political deal-making of Belgrade and Pristina – heavily pushed for by the US and EU. Therefore, some Serbs in Kosovo feel Serbia proper is selling Kosovo for EU membership.”. Finally, she points out the also the Serbian sense of belonging and heritage in Kosovo make some of them feel that “any cooperation with Kosovo Albanians is a form of treason, giving up on what is Serbian blood and soul”. “Some feel the pressure from all of that, as the political environment creates a situation where one can do almost nothing”, Borch explains. Serbian flags fly in the North of Mitrovica. Albanians flags fly in the South of Mitrovica. Paradoxically, an Albanian graveyard located in the North of Mitrovica can be found in perfect condition. In contrast, a Serbian graveyard located in the South which has been partly destroyed by the Albanians sometime during the conflicts in the last two decades. Serbians are predominantly Orthodox Christians. In this picture: the Saint Demetrius Orthodox Church in the North of Mitrovica. Most Albanians are Muslim. In this picture: a Mosque in the South of Mitrovica. In the South, you can also find this Orthodox Church. A Serbian family lives in the house next door, with 24/7 security protection. A white security booth can be seen in the photo. A wire fence protects the access to the property. A Serbian religious island of sorts, located in the middle of the Albanian side of Mitrovica. In the North, you can find the statue of Prince Lazar. He is at the heart of the Serbian identity due to his fight against the Ottoman Empire during the 14th-century invasion. In the South, you can find the statue of Shemsi Arif Ahemti, the Commander Shemi, who was martyred in the Kosovo War. He holds the title “Hero of Kosovo”. In the South, cars have license plates displaying the Kosovar flag. These cars cannot circulate in the North (at least not in complete safety). A solution for some has been to drive without license plates in order to avoid conflicts. All photos have been taken by Marisa López in the city of Mitrovica (with two exceptions marked with*).